The Model T Ford, which first appeared in the fall of 1908, went on the revolutionize transportation more than any other single invention. Henry Ford had founded The Ford Motor Company in 1903, and the Model T Ford was not his first car on the road. But during the 19-year production life of the Model T, it became the most famous automobile in histroy, due to its fine workmanship, excellent materials, and especially its low price. Early Ford Model T automobiles were produced in Detroit, Michigan at the plant on Piquette Avenue. Henry Ford’s stated intention was to produce the first automobile affordable to the masses. Indeed, from its $850 initial pricetag in 1908, Ford’s introduction of assembly-line mass production eventually lowered the price to under $300. By 1918, nearly half of the cars on the roads in America were Model T Fords. The advent of assembly lines cut the average assembly time from around 12 hours per car to about one and a half hours. The oft-repeated legend that Henry Ford required all Model T’s be painted black had a practical basis, in that the particular black paint in use dried much quicker than other sources, and thus further speeded production. The use of interchangeable parts not only speeded production, but reduced the cost of subsequent repairs. The typical Model T seated five passengers, produced 20 horsepower in its 4-cylinder engine, achieved a top speed of 45 mph, and ran on either gasoline or ethanol. Fuel economy was 15 to 20 miles per gallon. Ethanol became outlawed during Prohibition and gasoline became extremely cheap, so all alcohol and battery-powered vehicles faded from the scene. 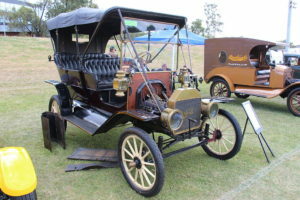 The Model T also became known as the Flivver or the Tin Lizzie. The original open touring car was soon joined by various closed models, and eventually small trucks. Early designers included Childe Wills, Harry Love, Eugene Farkas, Joseph Galamb, Gus Degner, and Peter Martin. Most Model T’s had only two forward gears and reverse. They had rear-wheel drives.The reverse gear often proved essential since the initial placement of the 10-gallon fuel tank was a good deal behind and a bit lower than its front-mounted engine. On steep hills, the car would often stall out when the tank wasn’t completely full, leaving the driver to back up the hill in reverse in order to maintain the flow of fuel. Model T’s were incredibly durable and dependable. Even after the introduction of electric starters (activated by a peddle on the floor board), the hand-cranked magneto remained part of the design as a back-up starting method. The wooden spokes on the artillery wheels with their pneumatic tires evolved to metal. The Model T was not the twentieth model made by Ford, as the alphabet would dictate. But it was a refinement of a number of prior Ford creations. Ironically, when Model T production finally gave way to something new, Ford dubbed his new creation the Model A, saying it was a whole new start. The Model A, however, never achieved the same massive impact of its predecessor. More than 15 million Model T automobiles were eventually manufactured. This world record was not surpassed until 1972 by the Volkswagen Beetle. Lawrence R. Bell is Editor of The Antiques Bible at http://www.antiques-bible.com/ppf/term/Ford+Model+T+Automobiles/definition.asp. The Antiques Bible is an illustrated glossary of antique terms with helpful links to related resources.